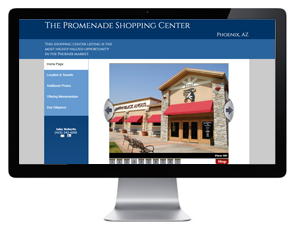 A custom web site builder for commercial real estate. so easy even a broker can use it. Build, preview, and test a ListingLab web site for FREE. If you like it and decide to use it, then pay just $25 per month, cancel anytime. Build, manage, and control all aspects of your property web sites with our easy to use management interface. Each listing has its own custom web site address to use in your email blasts and other marketing initiatives. Signup free 24x7, and have your listing web site up in 15 minutes. Pay nothing until you're ready to go to market. Save time and let your ListingLab web site manage and record confidentiality agreements. Use an online version that visitors can electronically sign, or a hard-copy to print, sign, and fax. Configure system to auto-approve electronic agreements or choose to manually approve contacts. Upload unlimited files and folders to your war room. Control access via an approval process. View who logged in, what they downloaded. Customize your property web site using one of 20+ template options (and more choices coming soon). Add your own text and photos; build photo tours online. Post your flyer for public download, require registration for more sensitive materials. Automatically includes contact information and vCards for the listing brokers. Let contacts download your offering memorandum without needing to call. Automatic due diligence builder for small and large file libraries. Provide reporting back to the owner of who has registered, signed CA's and a list of files they have downloaded. Contact visit history is available via Excel spreadsheets.